I went to change the chicks' water on Saturday, and something in the corner caught my eye. "What's that?" I wondered, "a rock?" I checked it out and let out a whoop that caused my neighbor to call over the fence, "What's going on over there?" I told her we had our first egg and she said, "Congratulations, you're a grandmother!" Well, maybe not, but I appreciated her enthusiasm. You know, we got chickens mostly for the eggs, and yet my surprise at finding that first one was almost perfect. One small little miracle, right there in the dirt. Time to get on the nesting boxes. Kevin has yet to post about the gorgeous coop he built, but he will. It's finished now. Which reminds me, Stefani and I are hosting a backyard chicken workshop on Saturday, August 8, noon--2, at our place in Berkeley. We're planning to share with folks everything they need to know to get started with their own chicks---like, hey, expect eggs! There's a $20/per family suggested donation, and no one will be turned away for lack of funds. We'd love to see some of you there! In the middle of a foggy afternoon, glimpses of summer sweetness still to come. I actually have no idea of the variety for either melon; I'm just happy about them. Another six or eight cups of blackberries today, in a quick visit to the patch. Enough for the workshop tomorrow and a handful in my ice cream tonight. Yum. It's that time of year again. I'm so glad I went out to look at the patch the other day -- the berries were big and heavy and sweet. Denise and I always comment on how everything is new to us each year. On the upside, this means that we don't suffer from boredom or burnout too often. The downside means that we go picking the first time without gloves or long sleeves or hair ties. The thorns rake into our arms, snag our clothes, and catch Denise by her long long hair. We laugh and say the same things every single year. I hear Denise muttering, "Come to mama," and I say, "I need a harvest hovercraft. Why can't I have elastic, expando-retracto arms?" In a half hour, the two of us had picked 18 cups of berries. I went back briefly today, in between swim lessons and afternoon kung fu. This time I came armed. A new picking stick (seen above) was five minutes' work with some tools. I want to attach a leather thong with a slider onto the end. If the notch went both ways, I could push brambles as well as draw fruiting bunches to me. I brought gloves, and discovered that using only one glove works best for me. One hand grabs and wields the stick; one hand gently receives the ripe berries and drops them to the flat. What did we do with those 18 cups of berries from the first outing? One bunch went into a batch of jam, as so many will before the summer is over. This jam was special, though. Denise and I have decided to share our skill sets with the people around us. In our area, there appears to be an explosion of workshops led by folks with expertise in one thing or another: gardening with kids, slaughtering home livestock, jam making, tomato growing, beekeeping, etc. Partly to garner some income, partly to try this out as a future employment option, we decided to float a jam making workshop and see what would happen. We have a full paid house for the upcoming Saturday workshop. Since we've never done this before, a run-through with a sympathetic audience seemed appropriate. Fortunately, we have friends who have either not made jam or were just interested in seeing us in action. Eight of them gathered and they made a batch of wild blackberry and one of mixed plum,with our support. My kitchen was a happy place, with lots of willing workers and a house full of children too. They gave us helpful feedback about our presentation, good suggestions for handouts, pricing, and pacing, and seemed genuinely happy about the day's activity. Two jars of jam each probably sweetened the deal! We talked about how people long for the old skills to not be lost, and how they want connection to their food and their forebears. Demystifying preserves seemed to be a big key -- years of conditioning have made many people afraid of doing something "wrong," and caused the belief that "experts" are different from "people with experience." I'm not complaining -- addressing these feelings might make a nice side income for me. I am a little saddened, though, that what my grandmother and at least one aunt did as a matter of course is now akin to the black arts for many people. (Not many readers of this blog, I think, though.) Sharing the unbelievable bounty of the food around me and sharing my skills makes me feel useful in a deep way, so that's what I get out of it. I hope the ripple effect keeps on going. I also hope the folks on Saturday feel like they're getting their money's worth! If you have a skill that you take for granted, and you live in an area with people who are interested in it, and you like having people around, this kind of skills sharing might be something to consider.
. . . not the mail, but my sister's hands. Denise sweetly went all the way out to the fair to claim our goods. She picked up a sweater, a skein of yarn, and some marmalade for me, in addition to her award-winning jam. There were envelopes with our prizewinning ribbons in them. And. . . checks! Apparently the powers that be aggregate your winnings and cut one check. So that sunflower bread? I won $10 . . . in addition to the free tickets and such. A nice bit of fun, that. The sweater got $10 also -- whee! As Turltlegirl pointed out, they don't seem to care that the wondrous colors are the responsibility of the dyer, not the knitter. They did say my stitches were nice and even, though. And not a word about the horrifying seams. I'm just delighted with it all. It seems like one of the most fun things to do in a summer. The other one is picking blackberries, and lo how the season is upon us. In my refrigerator rests a bowl of macerating fruit, to put into jam tomorrow, and in the oven rests a blackberry silk pie -- seedless puree plus a custard. I'm already thinking of how I can alter this for future attempts. I've never felt that I had enough berries to cast away the leftover pulp, but this year? More berries than I think I've ever seen. I have almost every day picking plans, in addition to dealing with my ongoing fascination with the idea of a harvest hovercraft and/or elastic arms. Today I realized how lucky I am to be picking fat, luscious berries without the humidity I associated with picking as a child -- Tennessee was the only place I knew you could go and pick. While we possibly could have found them in Southern California, no one I knew did that sort of thing. I'm hugely grateful to be that sort of person and to have the berries to indulge her. Anyone else remember that line from "A Christmas Story"? I didn't get a leg lamp, but I got something oh so very exciting at the fair last week. It all started with a letter. A letter that said, essentially, you've won an award, there's going to be a ceremony, here are some tickets and a parking pass, please come. 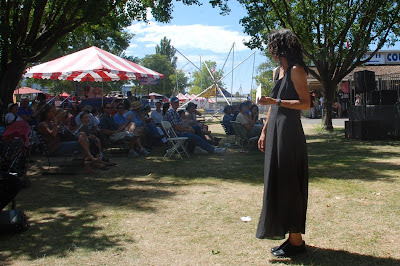 Yes -- what I do not appreciate at the fair? Heat. Lots and lots and lots of heat. The previous visits were during an unseasonable cool snap, and it was actually kind of fun to be there. 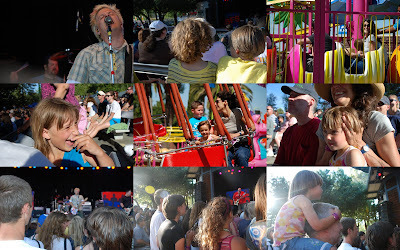 Even going on little rides wasn't bad, and as I mentioned before, the concert was all we could ask for. Not this time. It was hot. I'd dressed as loosely as possible, and I was still melty. So, we sit outside with a crowd, and sit through what felt like fifty sponsored awards. It was then I started to get suspicious. The fair applications are pages and pages long, and I do read my sections pretty carefully. The baked good section had a little asterisked comment that since the fair theme was "sunflowers," using sunflower seeds or oil could get you a special award. I'd used sunflower seeds in my second-place bread. Then they called my name, and I got to shake hands and get the special award envelope. 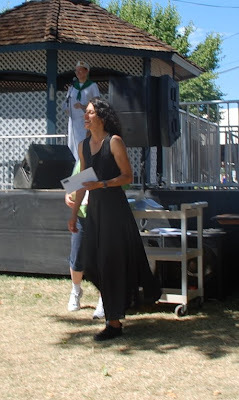 After posing for a picture by the crazed-looking fair photographer, Eric and I looked though my special award envelope. Not a lamp. A letter, saying "Dear award winner, congratulations for winning a sponsored award for ___________" and in the space was handwritten "best use of sunflower seeds/oil in a baked good." Then I went to visit the unawarded spinning and the sweater and we sweltered home again. Still, the worst day at the fair isn't that bad and soon I get my sweater back. 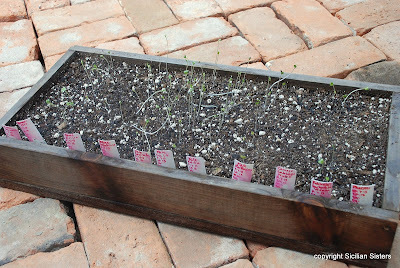 Last week, I tried to start seeding my winter garden. Since I scored some plastic mini-blinds on Freecycle, my new ideas about recordkeeping were easy to implement. With a few simple codes, I have variety, date seeded, number of seeds planted, number germinated, date germinated, and date transplanted all easy to see and keep track of. 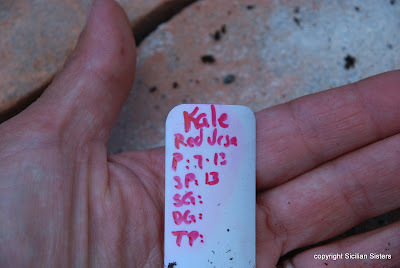 After that, the idea is that each plant would get its own tag, either ground-planted or tied on. Besides needing a thin-tipped Sharpie, it worked okay. Unfortunately, I didn't get my entire act together. My seed-starting light setup has a short somewhere and if I forget and go down barefoot and touch it, I get a nasty shock. I dismantled it and began to look for the problem, but didn't get it found and the lights reassembled. No problem, I thought, I have time. I now have a flat of salad sprouts, I guess. That new fancy potting soil and good seeds did the magic faster than I expected. Time to redo! On the upside, those bricks in the background are half of our patio. I'm hunting for a source of free bricks to finish, too. I'm sure they'll sprout up in time. Oh -- does anyone know how Denise and I can put an author line under the title of each post, so it's easy (without identifying the author style) to see who's writing what? We were out of town last weekend (here), and what a difference a few days make. For one thing, our chicken sitter gave the girls their first night not locked in their coop; happily they didn’t have any visitors. Also, the garden grew. A lot. One of my planting challenges has always been leaving too much space between seeds/seedlings, making for a sparse-feeling garden. I was determined not to do that this year, and boy howdy, I didn’t. The back plot, planted with corn, squash, beans, and cucumbers, is in a tangle. 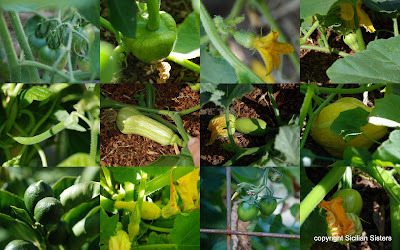 I can’t tell where one squash ends and another begins; some intrepid plants are climbing right up the apricot tree and the corn, elbowing the pole beans out of the way. That squash is about 4 feet off the ground, climbing the corn and anything else it can get its tendrils around. The lemon cucs are making a valiant stand against the zucchini. Meanwhile, the walkway is now a vine-tangled “walkway,” with the vines reaching for the chicken coop. I just hope the chickens don’t sit still too long, otherwise the squash constrictors might get them. We’re toying with the idea of training the vines onto the roof of the coop, where they can reach the neighbors’ bamboo. From there I guess the sky's the limit. The squash isn’t the only thing overgrowing its bounds. Here’s a shot of the pathway between the garden beds. The tomato plants are so tall and so dense, I can crawl in among them and disappear. The scent of tomato foliage is one of my all-time favorites, though, so I could be pretty happy in there. And behind them, the sunflowers are having to reach pretty high. The vines are so heavy with fruit, though, that if even half of it ripens healthily, we’ll have a bumper crop. We’re keeping our fingers crossed. so we’re pretty tickled to see these. As to what's going to become of the tangle that is the garden, we'll just have to practice patience. And maybe get a machete. I can't even think of a witty title. It's hot here -- not hotter than other people have, I'm sure -- but it's hot for us. And when you live in an area with generally very mild temperatures and not a whole lot of variation, a big change isn't something one is prepared for. I'm happy, for example, that we sprang for a whole house fan. It's still cool enough in the evening that we can manage to sleep. Very very few people here have air conditioning, and even then it's usually a window unit. Houses built in 1880 didn't have central heat and air as options, usually! Add excessively sandy soil and no automated irrigation, and you've got a stressed garden and a stressed gardener. I'm worried that some of my bush beans won't bounce back. They got extra water this evening, and I'll visit them again in the morning, but really crispy leaves cannot be a good sign. Some of the squash blossoms are being blasted by heat early enough that they're not opening. I hope I'm not only going to get the ones that are already pollinated. Surely this heat snap will have an end? Even the potatoes, which are in mostly imported and therefore not very sandy soil, were not fully happy. I expect them to bounce back but I'm worried about that one in the front there. Enough moaning from me about heat. I have some questions and some cuteness. Ideas about what kind of insect eggs these might be? Horizontal groupings? You can click to make the picture bigger. There have been some leaf miners in the leaves, but I don't think this is them. Ideas? The little piquin peppers are about the size of my little fingernail. So very very cute. I have no intention of eating them -- too hot, I'm sure -- but someone has to want to. And they're so cute! Guesses as to what kind of squash this is? I know I wrote down the kinds, but I'm kind of stumped, and the field tagging was, erm, lacking this season. Finally, the chicks are getting bigger. Still not quite big enough to mix it up with the older hens, but they're getting there. Hope everyone else is nice and cool. The first concert for three of my four children, all of whom ended up down in what passed for a mosh pit, prizes for both me and my sister for our entries, and lovely weather. We couldn't have asked for more. Except maybe fewer spinny rides. Click to make the collage bigger, if you wanna see. I "did" the bees today. That meant a quick peek through two hives, to check that they were still queenright and to see if they needed more room for honey storage. Yes, and no, respectively. Then I visited my "special" hive. This one has had and not had queens all spring. I didn't see a queen, nor did they begin a new one from a frame of eggs I'd given them, but they neatly capped that frame to rear the babies, and I found eggs, larvae, and pupae down in the lower portions of the hive. I mixed up the boxes a bit to consolidate brood, and figured I'd let them "bee." I've seen bees all over the yard lately. The oregano and lavender out front are covered with blossoms and bees, and the squash plants seem to sport big blooms with bees rolling in and staggering drunkenly out of them, coated in pollen. To celebrate, another poem, this one by Pablo Neruda, about whom I need to learn more, obviously! To all of us who dirty our hands to create what we do. that sweetness has its place. Lots of garden babies. I'm charmed all out of proportion to see that baby butternut squash is the same shape as big butternut squash. Who knew? Denise and I talk about how the gardens felt for a time as though there was a lot of "getting ready" going on, growthwise. Plants were getting bigger and even flowering, but we weren't eating much. Suddenly, it's as though I'm rising up to the crest of a big wave, from the ocean side. I can feel the power gathering. Just like bodysurfing, I know that the wave has an inevitable conclusion, as does the garden. Today's tiny harvest is only the start of that summer flood that I devoutly hope for and work toward. Pickling and lemon cucumbers (and I won't ever plant just two pickling cukes again -- what was I thinking? ), and three of the Romano pole beans that the chickens didn't get the first time around. I don't know about you, but this looks sort of like a salad to me. Oh -- there's a couple of volunteer lettuces coming up in the chard bed. In other news, I think I hilled the potatoes for the last time. I could have made one more level on the compost bin, but I didn't hill a few days in a row, and I think I see a blossom or two forming. I'd have liked to get higher, but the dirt is about a full 36" from where they were first sown. It's going to be fun to see how many pounds of Yellow Finns that ends up being. The tomatoes are covered with fruit, some Principese Borghese are ripening, the yellow crookneck out front has already yielded two squash for a frittata, and most things are growing nicely. I'm struggling to keep everything watered, and still need to finish digging the new patio. We have stairs, though! Kevin's been working hard and fast. I need to dig out the rest of the patio area, as we decided it should be bigger, but haven't yet. Just unmotivated. And this weekend seems as though it's not going to be a good one for work, as I have a run to do before the parade tomorrow, even though I said I wasn't going to do that again. Maybe I won't do any outside of my (flat) town. I'll hope to finishe the patio next week. P.S., Michele, the seeds are wonderful! I passed some on today to another blogger and we'll keep trying to share the wealth.